This beautiful music of Taizé is sung and played by the ecumenical choir at Christ the King University Church, London. Fifteen songs including "Da Pacem Domine," "Stay With Us" and "Ubi Caritas." Enrich quiet times of reflection or communal prayer services with this collection of Taizé-style chant music. Every year tens of thousands of pilgrims from many countries come to the village of Taizé in France. They come to take part in the distinctive prayer life of the Taizé Commnity, founded in 1940 by Brother Roger whose vision was to establish a spiritual center of reconciliation between the Christian churches. 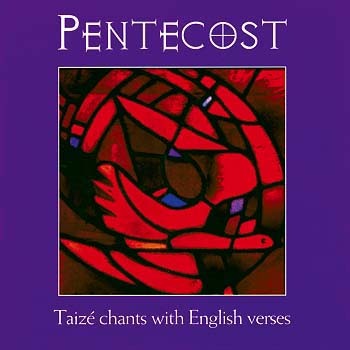 Pentecost presents well-known chants together with chants less familiar—15 in total—all equally hauntingly beautiful, including "My Soul Is Yearning," "Notre Pere" and a beautiful rendition of "Ubi Caritas." In keeping with the true spirit of Taizé, all of these chants have been recorded in a context of prayer and worship. An important and unique spiritual landmark, this exquisite Taizé music would serve well for meditation, personal prayer and communal prayer services.